Hours: Monday to Saturday, 11 a.m. to 9 p.m. Sunday, 11 a.m. to 5 p.m.
My mother hands me a business card for SumiLicious Smoked Meat & Deli. “It’s a Sri Lankan guy doing Jewish food for Chinese customers” she says. Mom and her friends sometimes go to SumiLicious for a nosh after the movies. Since Mom prefers to talk about her five gorgeous grandchildren instead of dining adventures, I get the sense SumiLicious is quite special. SumiLicious occupies a discreet corner of a sprawling Scarborough plaza just south of the Markham border. Nearby businesses include a dim sum spot, a congee restaurant and a large Asian supermarket selling wriggling eels from a tank. An old-school Jewish deli seems anomalous to the area. Fernando, a.k.a. Sumi, opened it here April 27 after learning most of his Schwartz’s customers from the GTA lived in Markham. 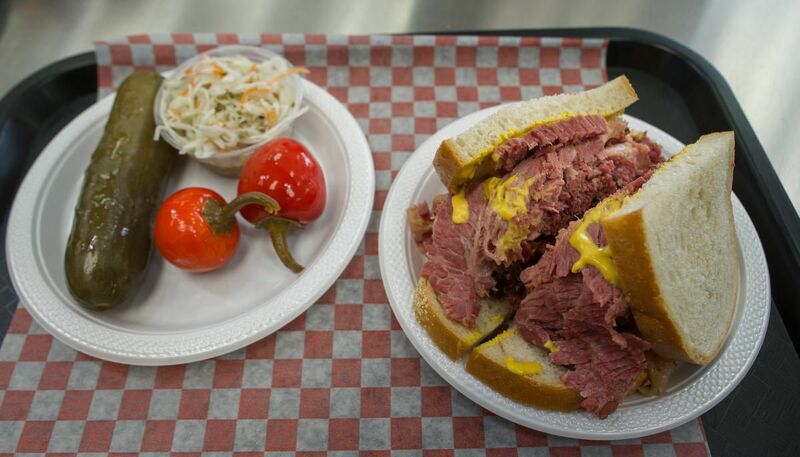 The small menu is built around smoked meat. The meat is good. Better than good, although it neither travels nor reheats well. Avoid takeout. Fernando turns tough beef brisket tender through 10 days of brining, followed by six to eight hours of smoking and a final round of steaming. Smoked meat isn’t known in Sri Lanka, Fernando points out. He got a job at Schwartz’s 10 years ago upon immigrating. He tweaked his technique over the years, first in his small apartment, later using a backyard smoker when he bought a house. Wife Shalika De Fonseca was his taste-tester. “When she said ‘yes,’ I knew I was ready,” says Fernando, 46, of his move to Toronto to open his own shop. Sandwiches ($8.99) bulge with meat, the top rye slice tilting off like a playground slide. You should only meet a sandwich so gorgeous. The meat is soft, the fat is melting, the yellow American mustard bracing and the Future Bakery rye pillowy with a snappy crust. Deepening from blush pink in the centre to magenta at the edges, the beef has a iridescence under the lights and fibres that spread open like Bubi’s welcoming arms. Black peppercorns outweigh cracked coriander seeds as seasoning; Fernando won’t divulge other spices but I suspect garlic and paprika. Like any good deli, customers can customize the fat content: lean, medium or fatty. “At the beginning, people wanted so much fat I was throwing out the lean,” Fernando says. Hey, it’s their heart attack. Forget the barely controlled chaos of the order counter at lunch, where Sumi slices meat with metronomic precision while talking to three people in three directions at once. De Fonseca tries to stay on top of orders but can get muddled; the $3.99 bottle of mustard I paid for on one visit didn’t make it into the takeout bag. Ignore that stress. Or better yet, come mid-afternoon when the crowd clears out. Then Sumi has time to kibbutz. There are minor issues. The fries ($2.99) are mushy and the coleslaw ($2.25) is so peppery it could provoke a sneeze. And the sooner SumiLicious can restock the iconic cans of Cott’s black cherry soda ($1.99) — “there’s an issue with the cans,” De Fonseca says — the better. Still, SumiLicious checks out. My mother has steered me right. So for this and all her other acts of love and support, I say: Thanks, mom.